Sorry for the missing post yesterday; we did bathroom renos this weekend and I fell behind. On the plus side: brand spanking new bathrooms! Anyway, I don’t have a review prepared for this week, so we’re going to switch things up with this month’s Review Rewind, with a new review next week. 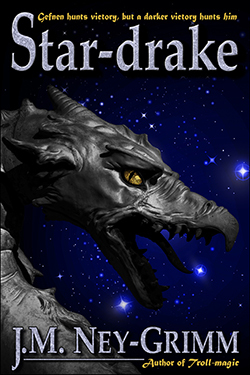 So, here is Star Drake, by J. M. Ney-Grimm! If you’ve been following Speaking to the Eyes, you know that I’ve got a new schedule: the first three Mondays of the month are a review of an Indie Author’s work. But what of the fourth week? Originally I thought I’d make that an interview, but with time constraints that’s not always going to be an option. So instead I thought I’d keep to the theme–I’ll use the last post of every month to reblog a previous Indie Review. I think it’s a nice way to revisit some of the best works I’ve read, and to put them front and centre for newcomers to the blog, or those who may have missed it the first time.